Click here to contact Bite Back! Thank you for purchasing our Bite Back! Mosquito Larva Traps. We are confident that you will be pleased with this inexpensive, “Green” way to help reduce mosquitoes in your yard. Unlike insecticides and other poisons, the Bite Back! Mosquito Larva Traps do NOT harm beneficial insects such as honey bees and butterflies. Open up your box of traps and separate the various pieces. Place one of the clear buckets on a flat surface such as a table or counter top. Locate the ascension barrier (a clear round ring with 6 small cones on it). Place the ascension barrier into the clear bucket with the cones facing up. It will rest on a ledge located approximately halfway down. Next place the black funnel into the bucket and press on the sides to snap it in place. 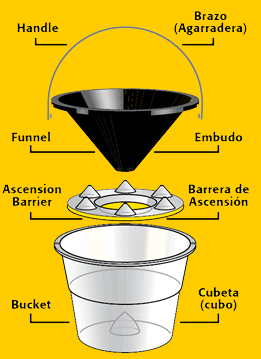 Please note: If the lip of the funnel does not touch the lip of the bucket when you put it in, the ascension barrier is probably upside down, or is not resting on the inside bucket ledge properly. Re-position if necessary. Locate the handle and snap the two ends into the handle notches located on the outer edge of the funnel. Now that your first trap is assembled, repeat the process for the other traps. 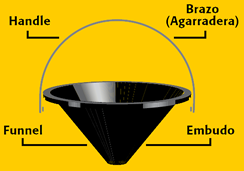 Using water from any source, fill the traps high enough to reach the rough area located on the inside top edge of the funnel. Each trap holds approximately 2.5 liters of water. We suggest that you check the water level every two weeks and replenish it as necessary. Please note: If you need to add water to the traps more than once every two weeks, it is likely due to pets or wild animals drinking from the traps. Congratulations. You are now ready to place the traps as close to the corners of your property as you can, spacing them between 150 and 200 feet apart. We recommend placement in shady areas but not directly under bushes that shed leaves year round. When placed directly under one of these bushes, the falling leaves tend to clog the trap opening and reduce its effectiveness. In approximately 4 weeks you should notice a reduction of mosquitoes in your yard. After approximately 6 weeks you should be able to enjoy your yard without so many bothersome mosquitoes annoying you. We recommend you maintain your traps throughout the mosquito season to minimize re-infestation from mosquitoes living in neighboring yards. Now enjoy your yard all season long! © Copyright - This page and it's components are copyright to Bite Back!, LLC and may not be used without express permission.